Portsmouth is a cool place during October. 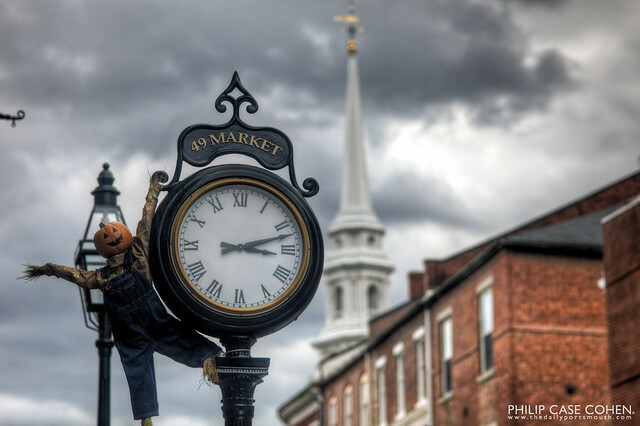 In addition to the New Hampshire Film Festival, Portsmouth also hosts Scarecrows of the Port (awesome scarecrows posted around downtown…my favorite is above Jumpin’ Jay’s this year…and will be featured next week)….including the little guy seen here hanging from the clock at 49 Market Street (donated by Summerwind Jewelers). This shot was taken with my Carl Zeiss 100mm Hasselblad lens, with some beautiful clarity on the clock…falling off in the background to a nice soft view of the Athenaeum building and the North Church. In addition to today’s photo – you MUST head over to my Flickr gallery HERE in order to check out more shots from the 10th Annual New Hampshire Film Festival.